Zion Market Research has published a new report titled “Ultrasound Devices Market by Technology (Doppler Ultrasound Imaging, High Intensity Focused Ultrasound (HIFU), 2-D Ultrasound Imaging, 3-D and 4-D Ultrasound Imaging, and Lithotripsy Ultrasound Imaging) Market for Cardiovascular, Obstetrics and Gynecology, Gastroenterology, Radiology, and Other Application: Global Industry Perspective, Comprehensive Analysis and Forecast, 2015 - 2021”. According to the report, global ultrasound devices market was valued at around USD 6.80 billion in 2015 and is expected to generate revenue of approximately USD 9.50 billion by end of 2021, growing at a CAGR of around 6.0% between 2016 and 2021. Ultrasound devices are typically used for imaging in the healthcare industry; it helps to picture the internal organs of the body. In particular, it is used to assist or guide interventional procedures in growing. It is free of radiation risk, portable, and relatively inexpensive when compared with other imaging modalities, such as magnetic resonance and computed tomography. Global ultrasound devices market is primarily driven by increasing demand for minimally invasive surgeries coupled along with increasing prevalence of chronic disorders such as cancer, heart disease, etc. Other major driving factors for increasing demand are a large number of technological advancements (such as 3D & 4D imaging) in ultrasound systems and favorable rules and regulations. However, lack of experienced and trained sonographers is major restrain that may limit the growth of the market. 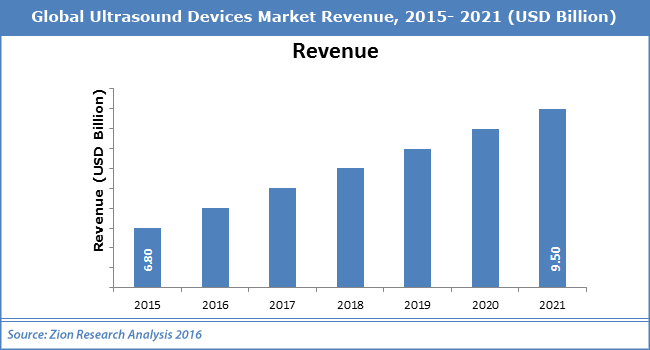 Nonetheless, growth in emerging economies is likely to disclose the new avenues for ultrasound devices market in the near future. The ultrasound devices market is segmented on the basis of different technologies including doppler ultrasound imaging, High-Intensity Focused Ultrasound (HIFU), 2-d ultrasound imaging, 3-D and 4-D ultrasound imaging, and lithotripsy ultrasound imaging. In 2015, 3-D and 4-D ultrasound imaging was the largest segment in ultrasound devices market and accounted for the largest revenue share of the total market. Additionally, it is expected to continue its dominance and be the fastest growing segment in the global market over the forecast period. 3-D and 4-D ultrasound imaging segment is expected to witness the fastest growth as they are technologically superior. Cardiovascular, obstetrics and gynecology, gastroenterology, radiology, and others are the key application segment of the global ultrasound devices market. The radiology application segment dominated the market in terms of revenue while obstetrics and gynecology segment is another major segment of global ultrasound devices market. North America, Europe, Asia-Pacific, Latin America and the Middle East & Africa are key regional segments of global ultrasound devices market. Europe held the largest market share in 2015. Asia Pacific was the second largest market for medical device coating in 2015. Asia Pacific is expected to be the fastest-growing revenue contributing region in ultrasound devices market during the forecast period. Moreover, Latin America is also expected to show noticeable growth for this market in the years to come. Some of the key players in ultrasound devices market include Philips Healthcare, Siemens Healthcare, Analogic Corporation, Esaote S.p.A., Samsung Medison Co. Ltd., Hitachi Medical Corporation, Toshiba Corporation, Mindray Medical International Limited, GE Healthcare, and Fujifilm Holdings Corporation among others.